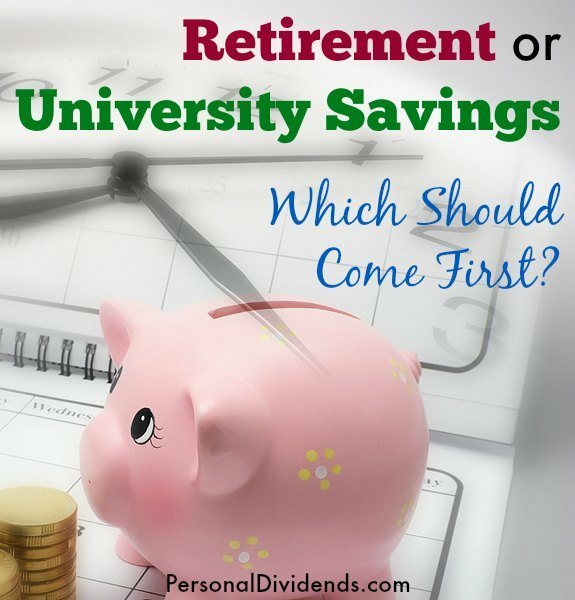 Retirement or University Savings - Which Should Come First? Most people don’t have the luxury of being able to address all financial concerns at the same time, at least not in any substantial way or even in equal measure. Most of us have to make choices and set priorities. This is often the case when you’re facing a choice between funding your retirement or university savings for your children. Both are major funding projects, and both involve goals that have great strategic significance in virtually every household. After all, you want to be in a position to be able to help your children attend university, but you also need to provide adequate funding to help you survive later in life when you are no longer working. So if you have to make a choice between funding retirement or university savings for your children, which should it be? This is an ongoing debate, with no easy answer, but I think that if you have to make a choice you should favor retirement over university savings. Due to the time value of money, both saving for retirement and for university are time sensitive. That is to say that the longer your investment time horizon is, the more money that you can accumulate in savings for the goal. While this is important in saving for university, it’s considerably more important in saving for retirement, if only because the time horizon is generally longer. For example, if you have two children, ages five and three, and you want to prepare your finances for them to attend university, your time horizon is about 13 years, or the difference between the age of your oldest child and the time he or she will start university. If at the same time you’re 30 years old, and you plan to retire at 65, your time horizon for retirement is 35 years. And when it comes to retirement, you’ll need every one of those years. Since retirement is a very long-term savings goal, the size of your retirement portfolio will ultimately be determined more by the time value of money than even the amount of your contributions. For example, if you have $20,000 in retirement savings, invested at an average rate of return of 10% per year, after 20 years it will grow to $134,440. But if you allow it to grow for 40 years, it will reach $905,185. That could be the difference between a retirement of struggle, and a retirement in comfort. Because the time horizon in saving money for university is much shorter, the time value of money doesn’t have nearly as an great impact. As important as it is to help your children, particularly with a major expense like university, it’s even more important that you secure your own financial position as a priority. Logically, the better your financial position is, the more that you’ll be able to help your children. If you make sure that your retirement funding is where it needs to be first, that will make it much easier for you to provide assistance to your children. Equally important, if you were to prioritize saving money for university, that could leave you financially depleted and unable to retire. In that situation, you could conceivably become a burden to your children, in which case they will be effectively giving back all of the assistance you provided for their educations, in an attempt to help you with retirement. It really defeats the purpose when you think about it carefully. If you don’t adequately prepare for retirement, you won’t be able to retire – it’s that simple. If you are 55 or 60 years old, and you have not made adequate provisions for your retirement, you could be in exactly this situation. That’s why it’s important to prioritize retirement savings as early in life as possible. With university on the other hand, there are always other options. For example, you can have your children attend less expensive schools. You can also enlist them in helping to provide at least some of the funding for their educations. And failing all else, you can always rely on student loans to cover what you can’t afford. Since retirement has fewer options than your children’s education, you need to prioritize retirement. This may be the single most compelling reason to favor retirement savings over university savings. Should one or more of your children decide not to go on to university, you will have saved a substantial amount of money that will never go for its intended purpose. It’s even conceivable that a university education will be less important in the future than it is now. We have no way of knowing what the future holds, but there are different scenarios under which university educations for your children could turn out to be less necessary than you originally imagined. But with retirement however, it’s entirely unlikely that it will ever be unimportant. In fact, even if you decide to delay your retirement by a few years, it will just be a question of time before age and physical condition will require it. Given that arrangement, funding retirement comes up as an absolute necessity. Funding university educations for your children – as important as it may seem at the moment – could very well turn out to be no more than optional. Necessity versus option – which way would you go?